(Phys.org) —Astronomers working to estimate the rate of star formation inside murky distant galaxies, those shrouded in dust clouds that make it very difficult to study them, have published data from a brand new instrument, providing the most precise picture yet of what happened 4 billion years ago at their hidden centers. 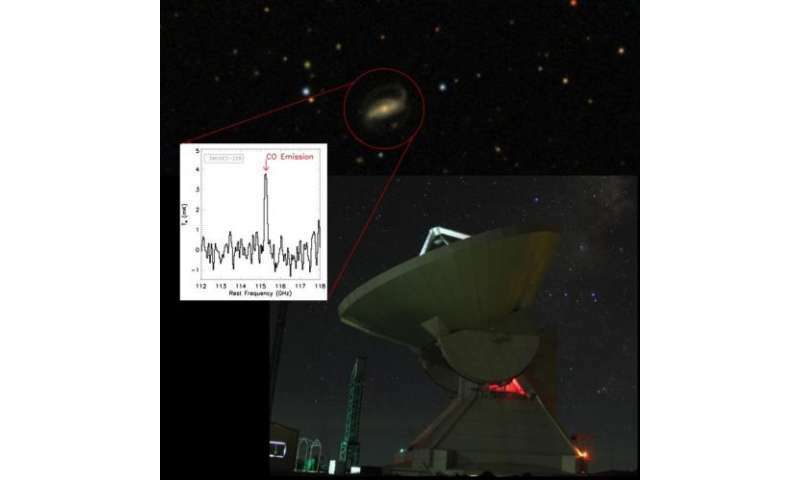 An international team of astronomers led by the University of Massachusetts Amherst with collaborators from Instituto Nacional de Astrofísica, Óptica y Electrónica (INAOE), report details in the first scientific paper based on data collected by the Large Millimeter Telescope Alfonso Serrano (LMT) and its Redshift Search Receiver. Others on the research team are from Caltech in Pasadena and Nanjing University, China. Findings are now online and will appear in the Dec. 10 issue of The Astrophysical Journal. UMass Amherst doctoral student and first author Allison Kirkpatrick says, "Looking at these distant dusty galaxies presents a puzzle. Large amounts of dust are glowing very brightly, but in order to understand what's going on inside the galaxy, we want to know what heated the dust initially." The two main possibilities, she adds, are new stars forming, which are more massive and hotter than older stars, or an active galactic nucleus (AGN), which is a supermassive black hole at the center of each galaxy. As the black hole grows, it gives off enough energy to heat the surrounding dust. Findings in the new LMT study should help to resolve uncertainty that's lingered for years over the relationship between molecular gas and dust that surround these galaxies, the researchers say. Molecular gas is the fuel for forming stars; the new LMT observations measure the amount of molecular gas in each galaxy, which tells scientists how many stars that galaxy is capable of forming. On the other hand, light coming from the dust tells scientists how many stars have formed in the past 10 to 100 million years. If a galaxy is undergoing steady star formation, there is a distinct relationship between the amount of molecular gas and dust heating in a galaxy. Scientists suggest there is a different relationship between the molecular gas and dust in "star-bursting" galaxies, where massive bursts of star formation take place on a short timescale, likely caused by a galaxy colliding with another one. By removing the AGN contribution to the dust heating, the new findings suggest a model in which all galaxies may have the same relationship between gas and dust, with no separate relationship that only applies to star-bursting galaxies. This is important because molecular gas is difficult to measure directly. It is much easier to measure the dust emission. If there is a known, stable relationship between the gas and the dust, then scientists can infer a galaxy's gas properties simply by studying its dust emission. "By comparing the dust and the gas contributions, we get a hint of what's triggering the star formation in the galaxy," Kirkpatrick says. "The AGN at the center of the galaxy and light from new stars have different light signatures, so what we've done is account for, or remove the AGN, leaving what we think is a more accurate model of star formation, which has never been demonstrated before." Professor Alexandra Pope, Kirkpatrick's UMass Amherst advisor, uses light from very bright dusty galaxies to study their evolution and developed the technique used in this study for identifying AGN light in the dust emission. Kirkpatrick, an expert in modeling infrared spectral energy distributions of very distant galaxies, says the LMT has added a significant new source of information about star formation with the current pilot study of 24 dusty galaxies in the constellation Draco that are part of the 5 mJy Unbiased Spitzer Extragalactic Survey (5MUSES), led by their collaborator George Helou at Caltech. Spitzer is operated by the Jet Propulsion Laboratory, California Institute of Technology, under a contract with NASA. The eventual 50-meter (164-foot diameter) LMT was designed to be the largest, most sensitive single-aperture instrument of its kind in the world. It began early science operations last year as a 32.5-m telescope, and is located on the summit of Sierra Negra, a 15,000-foot extinct volcano in the central state of Puebla, a companion peak to Mexico's highest mountain. The LMT is faster than any single-dish telescope now operating at detecting molecular gas in galaxies, the researchers point out. "It is ideal for studying the early universe because the farther back in time you look, the fainter the galaxies are and the longer you have to point the telescope at them. We collected light in a matter of hours that would have taken other instruments days to accomplish," Kirkpatrick says. "This was a pilot study with a small sample size, but we plan to use the LMT to increase the sample size and make our results stronger."